We have seen an immense amount of progress over the last few days but there is still a huge amount of work to be done. Heartened by the donations, our team in Helambu have broken new ground and reached previously cut-off villages. In doing so, they have been handing out supplies directly funded by our kind donors. Our local team touched based with the Kiul and Helambu Village Development Committees on Thursday (30 April) and returned on Saturday (2 May) with food, supplies and solar cells. Determined to reach as far into the affected area as they could, our team mobilised excavators to open the blocked road between Kiul and Timbu. In the several hours it took to open the road, two daring members of the team had already reached Tartong and Phugpuche villages with solar cells (which provide the means for villages to charge phones and are used for light generated in the evening) and medicines. Our team was the first to reach Timbu village and quickly organised a fair distribution of supplies. The team then moved up to Norbuling, digging the road as they went. They delivered blankets, rice and dal for the school and then moved across to Shugenche. Over the next week, our team on the ground will focus on helping the following villages: Pading, Ichowk (one of the largest villages in the area), Dhudeni, Birkharka, Bangare, Gufa, Gunsa, Tartong, Rivarma, Bhotenamland, Jyamire, Dhusenichaur, Kotgoan, Lekharka and Baruma. Having mobilised local volunteers in these areas, the aim is to get food supplies and basic shelter kits to each of these villages. To provide shelter our team have ordered 1500 tarps from India which are due to arrive in a week. 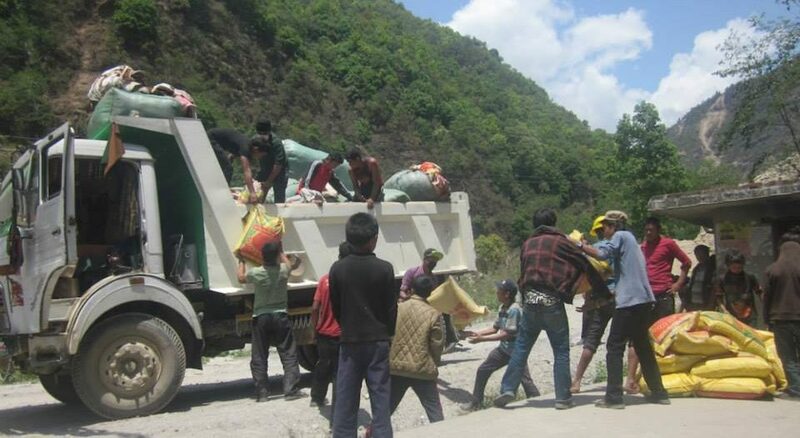 Additional funds have been utilised in booking a truck to transport supplies. The use of solar cells has quickly enabled communication with teachers and other key community members in the villages. Another 25 were purchased over the course of the weekend and these were taken to Helambu by the team yesterday. Two larger solar cells have also been sourced and engineers have been sent to Gunsa and Bohotenamlang to help maintain power supply. As the weeks move on, our thoughts will start to turn to medium and long term solutions, but for now the aim is basic and immediate relief for those affected in the region. Catch up on all of our blogs on the Nepal Earthquake here.